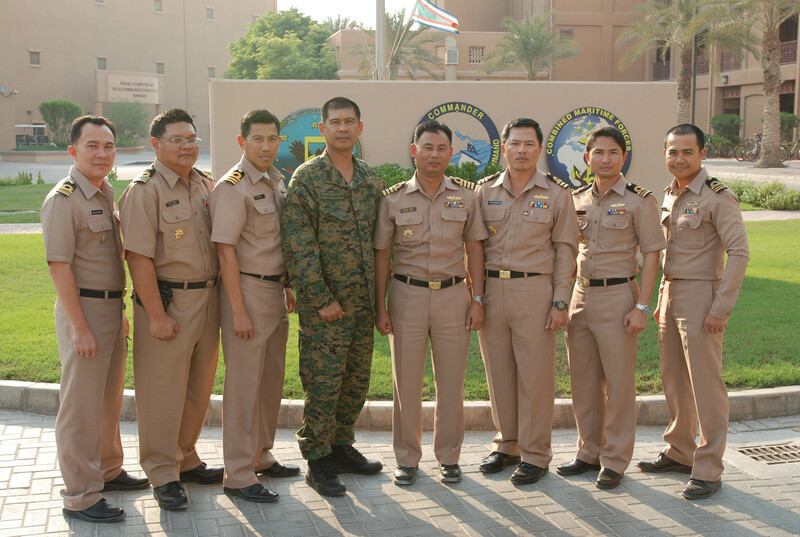 Above: Eight officers from the Royal Thai Navy have arrived at Combined Maritime Forces headquarters, Bahrain, in preparation for the historic deployment of two Thai vessels to the Gulf of Aden. (Left to right): LCdr Suthep Phongsrikul, LCdr Kovit Talasophon, Cdr Siripat Pangpun, Cdr Yutthana Eamsa-Ard, Capt. Yuttasath Threeost, Cdr Pisutsak Sreechumpol, LCdr Prasertsak Mala and LCdr Pairat Chaiwong. MANAMA, BAHRAIN – Eight officers from the Royal Thai Navy have arrived at Combined Maritime Forces headquarters, Bahrain, in preparation for the historic deployment of two Thai vessels to the Gulf of Aden. The offshore patrol vessel, HTMS Pattani, and the support ship, HTMS Similan, will conduct counter-piracy operations with Combined Task Force 151 (CTF-151), currently commanded by Rear Admiral Sinan Ertugrul of the Turkish Navy. The 98-day deployment involves a total of 351 Thai personnel, led by Rear Admiral Chaiyot Sundaranaga. CTF-151’s mission is to deter, disrupt and suppress piracy, protecting maritime vessels of any nationality and securing freedom of navigation in the Gulf of Aden and Somali Basin. In conjunction with NATO and EU Naval Force Somalia (EUNAVFOR), CTF-151 conducts patrols in the Internationally Recommended Transit Corridor (IRTC) and supports Best Management Practice (BMP) methods for piracy avoidance that are promoted by the shipping industry. In order to prepare for the integration of Thai vessels into the coalition fleet, a small team from Coalition Communications based at Naval Support Activity Bahrain flew to Sattahip Naval Base, Chonburi, Thailand, to provide technical assistance and training associated with installing and operating communication equipment and networking capability. Four team members are sailing with the two vessels to provide continuing support. CTF-151 is one of three task forces operated by Combined Maritime Forces, of which Thailand becomes the 25th member nation. CMF is a unique naval coalition, dedicated to promoting security and prosperity across some 2.5 million square miles of international waters in the Middle East. CMF’s main focus areas are defeating terrorism, preventing piracy, reducing illegal activities, and promoting a safe maritime environment.